You're gonna burn, you're gonna burn"
With warmer days and thoughts of camping, here's an idea for creating your own fire starter. See Instructables.com for more details, photos, and alternative ideas for fire starters. 1. 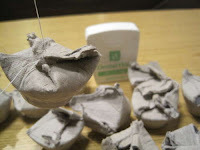 Gather dryer lint, an empty paper egg carton, old candles or wax, dental floss, and scissors. 2. Cut or break the wax into small pieces for faster melting. 3. Melt the wax in a double boiler set-up using a disposable glass jar or can with an opening several inches across. The can or jar will get quite messy. Place the can or jar in boiling water (keep on eye on the water level - too much and the jar will float and perhaps tip over, too little and the pot goes dry) Once the wax is melted, turn down the heat to a simmer (or off) to avoid buring the wax. 4. Stuff the lint into the egg carton compartments. Pack as much as possible for longer burning. 5. Cut apart the egg carton compartments and fold the edges over to cover the top. 6. Tie the lint up inside the closed compartments with dental floss. Leave six or more inches at the end of the knot for you to hold in the next step. 7. Did each package into the wax. Cover completely and let the wax soak inside. Wait for no bubbles rise from the package. Set packages on paper towel to drain. 8. When done pour extra wax over the starters (for extra water proofing). Let the starters dry for an hour or two. 9. To use, light a corner with a match and enjoy for 15 minutes or so. The comments on the Instructables website include some variations like pouring the wax directly into the egg carton before cutting the compartments apart, using twine instead of dental floss so it acts as a wick, wrapping the lint in strips of newspaper instead, using a crock pot to melt wax, etc. This is a simple idea with many ways to be creative. Just don't melt the wax over direct heat - you could get a flash fire.